A summary of today’s show: Scot and Susan discuss with Fr. Roger Landry and Gregory Tracy the news of the week, including Cardinal Seán’s new pastoral letter on Evangelization, the Springfield diocese’s tornado recovery efforts, the new cause of canonization for Fr. Joseph Muzquiz that just started in Boston; and milestones related to priests in Fall River and Boston. 1st segment: Scot welcomes Susan back to show. Susan said she’s just back from the Sacred Hearts Retreat House in Wareham where she met with New England regional diocesan catechetical directors in a day of reflection. Scot said the Pastoral Center has been busy today because the convocation of the archdiocese’s priests has been taking place nearby at Lombardo’s in Randolph. Fr. James Moroney addressed them on the changes to the Roman Missal that are coming this Advent. Videos of recent workshops on the changes coming to the Liturgy are available on the archdiocese’s website. 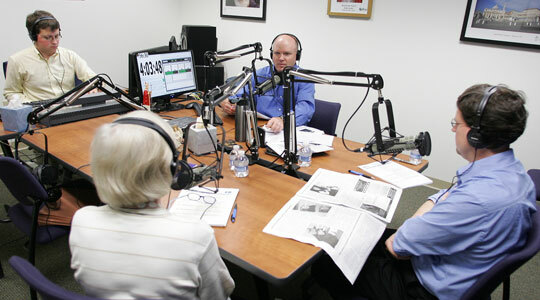 2nd segment: Scot begins by talking about the Cardinal’s new pastoral letter called “The New Pentecost.” He asked Fr. Landry to explain pastoral letters. It is meant to help Catholics to approach an issue from the perspective of the Catholic faith. It’s a study by the author on a theme that he believes those to whom he’s writing it need to react and respond to. This pastoral letter is a response of Cardinal Seán to starting in 1992, Pope John Paul II began calling for a New Evangelization of the Americas on the 500th anniversary of the discovery by European Christians. This calling to a new evangelization is meant to address those 83% of Catholics who don’t regularly go to Mass very Sunday as well as those of the other 17% who have not let the Gospel fully impact their lives. Scot asked Gregory what he makes of the Cardinal releasing the document on Pentecost and linking evangelization to Pentecost. The Holy Spirit overshadowed the apostles, converting them from cowering in fear and calling them to go out and proclaim the Good News. We’re also called to proclaim the Good News like the apostles did. Susan said that she’s this letter as being right up her alley in terms of using in catechesis, formation and religious education and see hiow it’s applicable to her ministry. Scot said we’re called to evangelize and spread the word to others. He asked Fr. Roger how important it is to make people understand this isn’t just the mission of the priests or professional lay ecclesial ministers. Fr. Roger said if we’re not bursting forth with the desire to share the Good News with others, we have to wonder if we’ve fully receive the Gospel and recognize what great news it is. Pope John Paul II said in the encyclical Mission of the Redeemer said 15 times that the work of evangelization is the work of all the disciples of the Lord. Jesus’ two great verbs are to “come” to Him, but also to “go” out into the world. Scot said there are 11 sections to the Cardinal’s letter. The first one states that Pentecost is the beginning of Evangelization. Then he talks about Catholics Come Home, evangelization as the start of each Catholic’s ongoing conversion; evangelization as the primary mission of the Church; the meaning of evangelization; parishes as centers of evangelization; pastoral planning & evangelization; the new Roman Missal as an opportunity for evangelization; new Church movements and communities; immediate steps we can take to evangelize; and Blessed John Paul’s oft-stated desire that all may know Jesus. 3rd segment: Scot recalled the tornadoes in the Springfield diocese last week, the four deaths and more than 200 injuries. The diocese was hit very hard as well. Susan’s counterpart, Sister Paul Robelard, said it was just terrifying. The chancery building wasn’t damaged, but St. Michael’s Resident, a home for retired priests and religious, was damaged. The chapel was ripped out of the middle of the building. The recently restored cathedral high school was also severely damaged. There are many people still without homes and it will be a long time getting back on their feet. Scot said in the weeks prior to that was the tornado in Joplin, Missouri. His children, seeing the news, were very fearful and he assured them that we don’t get tornadoes in Massachusetts, and now this happens. It left us all feeling vulnerable. Scot asked Gregory’s take as a journalist. Gregory said as terrible as the devastation as the Missouri was, it didn’t feel so close to home, but many of us know people in Springfield, and especially with those he works with in the diocese there. As important as reporting what happened is reporting the efforts that the diocese is making to assist those in need. Fr. Roger said people should pray. Bishop McDonnell has asked for prayers those who died in the storm, those who lost homes, those who were injured. These are our neighbors in both a literal sense and in a Gospel sense, so we could assist with monetary donations. But we also need to recall that our lives are a gift of God. It’s easy to go about our lives and not recall that this could happen to us at any time. We need to be grateful to the Lord for every day he gives us. We need to respond, not with fear, but with gratitude and trust. Also, be ready, because at any time our death could come. Are we ready to face the Lord in our personal judgment? Bishop McDonnell said Catholic Charities is looking for help with immediate needs for household items, toiletries, baby supplies, and monetary donations. On June 2 at the Pastoral Center was the opening of the cause of canonization for Fr. Joseph Muzquiz, a priest of Opus Dei, who brought the movement to the United States. Fr. Roger knows Fr. Dave Kavanaugh, the promoter of the cause and priest of OPus Dei. He said Fr. Kavanaugh told him that Fr. Muzquiz was one of the first three Opus Dei priests ordained in Spain the 1940s. St. Josemaria Escriva had asked Fr. Muzquiz to bring Opus Dei to the US. They first went to Chicago and then came to Boston, coming here literally with nothing, trusting in God. Eventually, the movement has flowered in the United States with many beautiful facilities, chapels, and retreat centers. Fr. Muzquiz was known for his incredible peace and heroic virtue. He lived the real message of Opus Dei, to become holy in the midst of your ordinary activities. You don’t have to be a martyr or travel to the end of the earth. He died on June 1, 1983. In order to be canonized, you need two miracles, so they have printed up holy cards with prayers so that people can pray for their own needs and those they love. At this stage, he is called Servant of God and they will now investigate whether he lived the theological virtues of faith, hope, and love to a heroic degree. Gregory said this is the first cause that he has experience with that has opened in Boston. The usual practice is that the cause opens in the diocese where the person died. He said though there were about 150 people present, many of whom knew Muzquiz personally, it was a highly canonical proceeding, with the reading of testimony and the signing of documents. There was a great sense of solemnity and it showed that the process of canonization is not just superfluous, but is very rigorous and much attention to detail is paid. Susan said she’s only familiar with the archdiocese’s connection to the cause for Blessed John Henry Newman, but that was an investigation of a miracle that occurred here, not the opening of the the cause and investigation. Scot said it was interesting to know about the formal roles in the process: the bishop of the diocese, the postulator of the cause (Fr. Kavanaugh), the episcopal delegate (Bishop Allué), the judicial vicar (Fr. Mark O’Connell), the promoter of justice (Fr. Rodney Kopp), and notaries (Fr. Michael Medas and Fr. Dan Harrington). Now the investigation will take testimony from many people and send that along with many other items of documentation to the Congregation for the Causes of Saints at the Vatican for consideration. They will investigate any possible miracle and perhaps make a recommendation to the Holy Father for beatification. Fr. Roger said those looking for miracles are encouraged to go to St. Joseph Cemetery in West Roxbury to pray at the tomb of Fr. Muzquiz for that miracle. 4th segment: In the Pilot this week is an obituary for Fr. Thomas Keane, former Air Foorce chaplain and Quincy pastor. In The Anchor this week are the obituaries of Fr. Luis Cardoso and Msgr. Edmund Levesque. Msgr Levesque is Fr. Roger’s predecessor at St. Anthony’s in New Bedford. When Fr. Levesque arrived in the parish in 1990, he decided to renovate the church, which is a massive church. Because he had no money, he did it himself, erecting scaffolding and washing and painting the ceilings, then sanding and repainting the pews. He started to raise money for the school by cooking the dinner at Bingo every week. He died at he was going up the steps of a church to celebrate Mass. Fr. Luis Cardoso was an immigrant from the Azores and spent his whole priesthood in Fall River ministering to Portuguese Catholics. Also this week, both dioceses celebrated the 25th anniversaries of a number of priests. The Boston priests celebrated Mass together at the Pastoral Center on Wednesday. Susan said she has worked closely with Fr. Foley and Fr. Mahoney in the central ministries and has worked with many of the other priests as well. Moving on to other news, Fr. Roger said the US bishops when they meet in Seattle next week will be discussing assisted suicide and will be giving us a document on it. In Massachusetts, there is a new movement to promote assisted suicide. It comes as Dr. Jack Kevorkian, advocate of assisted suicide and antagonist of the culture of life, has recently died. He said this will be short enough for most people to read and pass along. Gregory said The Pilot will have an article about Fr. Frank Pavone’s recent visit to Hingham and will summarize his talks on the pro-life cause. Also, Fr. Tad Pacholczyk writes this week on the topic of brain death and how to approach the issue from a Catholic perspective. Susan said she’s interested in the article in The Pilot on the workshop that was recently held in North Andover on the changes to the Roman Missal. Scot points out the article in the Pilot on the status of the archdiocese’s pastoral planning office. He said Msgr. Will Fay was on The Good Catholic Life yesterday to clarify some of the misreporting on pastoral planning in the media recently. The article has direct quotes from Fr. David Couterier from the archdiocese’s pastoral planning office that echo Msgr. Fay’s comments yesterday.